Born in Parkenstein, Bavaria, Franz Strauss had begun his musical career by the age of 7, playing the violin at a wedding dance. After musical study with his uncles Johann Georg Walter and Franz Michael Walter, in which he learned to play the clarinet, guitar, and all brass instruments, Franz Strauss at the age of 15 entered the service of Duke Maximilian of Bavaria as a guitarist. His study on the horn continued, and it was the horn that would become his major instrument. In 1847 he joined the Bavarian court orchestra, a position he held until his retirement in 1889. Franz Strauss also served as a professor at the Academy of Music in Munich from 1871 until 1896 and served from 1875 until 1896 as the conductor of the amateur orchestra "Wilde Gung'l." Franz Strauss married Elise Seiff, the daughter of a regimental band director, in 1851. While this was a very productive period for him as a composer and performer, it was a tragic period of his life; a 10-month-old son died of tuberculosis, and then cholera took the lives of his wife and young daughter, leaving him a widower at the age of thirty-two. Strauss did not remarry until 1863, at which time he married Josephine Pschorr, a daughter of the wealthy brewer Georg Pschorr. To this union two children would be born, and the elder, Richard Strauss (1864-1949), was destined to become a great composer. Strauss said bluntly that he could play no more. "Then take your pension!" said the irritated Bülow. Strauss picked up his horn, went to the Intendant, and asked for his pension "at the orders of Herr von Bülow." As he was indispensable, [Intendant Karl von] Perfall had to use all his diplomacy to smooth the trouble out. Beyond his very significant performing career, Franz Strauss also left a legacy as a teacher. Something of his method of teaching is known, as recalled by Franz Strauss's last student Hermann Tuckermann. The method of Franz Strauss is first of all to emphasize tone quality. He always said: "Only by sustaining tones and by interval studies can you achieve a noble tone." Therefore each lesson began with tonal exercises. 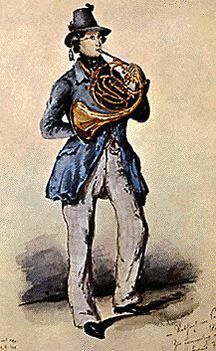 With his students he worked through the horn concertos, and the important parts from opera and concert literature. He never accepted a fee for his lessons. His main interest was to impart his experience and skill to hornists. This concern for tone must certainly have been a significant element of his success on the horn and is certainly reflected in his solo works as well.